General purpose joiner that merges sorted data from two or more data sources on a common key. If you want to join different slaves with the master on a key with various key fields, use ExtHashJoin instead. But remember that slave data sources have to be sufficiently small. ExtMergeJoin receives data through two or more input ports, each of which may have a distinct metadata structure. ExtMergeJoin propagates metadata from the first input port to the second output port and from the second output port to the first input port. ExtMergeJoin has no metadata templates. If set to true, records with duplicate key values are allowed. If it is false, only the last record is used for join. An URL of the file to which error messages for specified Error actions should be written. If not set, they are written to Console. If set to true, incoming records are supposed to be sorted in ascending order. If it is set to false, they are descending. One of these must be set. These transformation attributes must be specified. Any of these transformation attributes must use a common CTL template for Joiners or implement the RecordTransform interface. ExtMergeJoin is a general purpose joiner used in most common situations. It requires the input be sorted and is very fast as there is no caching (unlike ExtHashJoin). The data attached to the first input port is called the master (as usual in other Joiners). All remaining connected input ports are called slaves. Each master record is matched to all slave records on one or more fields known as the join key. For a closer look on how data is merged, see Data Merging. The Join key string in the example above contains sorting characters (a) (ascending) and (d) (descending). For more details on sorting, see Sort Key. You must define the Join key. Records on the input ports must be sorted according to the corresponding parts of the Join key attribute. 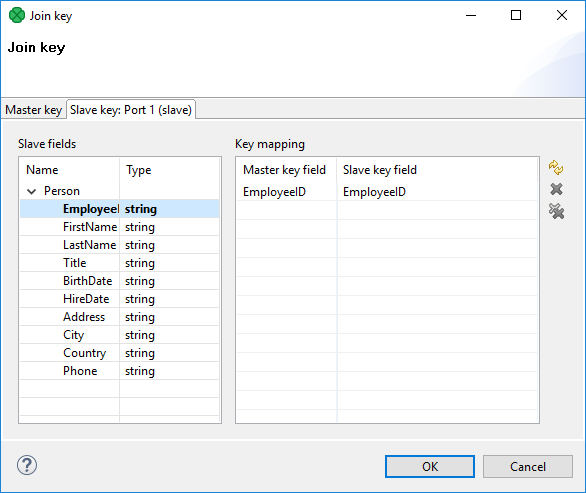 You can define Join key in the Join key dialog. In it, you can see the tab for the driver (the Master key tab) and the tabs for all of the slave input ports (the Slave key tabs). In the driver tab, there are two panes. The Fields pane on the left and the Master key pane on the right. You need to select the driver expression by selecting the fields in the Fields pane on the left and moving them to the Master key pane on the right with the help of the Right arrow button. To the selected Master key fields, the same number of fields should be mapped within each slave. Thus, the number of key fields is the same for all input ports (both the master and each slave). In addition, the driver (Master) key must be common for all slaves. In each of the slave tab(s), there are two panes: Fields and Key mapping. The Fields pane is on the left. There you can see the list of the slave field names and their data types. The Key mapping pane is on the right. 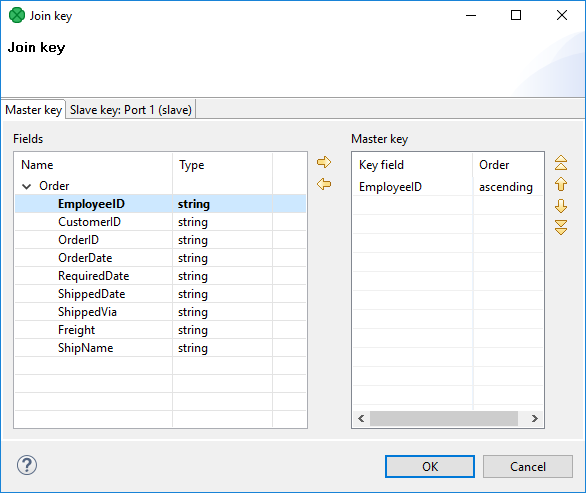 In the right pane you can see two columns: Master key field and Slave key field. The left column contains the selected field names of the driver input port. If you want to map some driver field to some slave field, select the slave field in the left pane by clicking its item. Then push the left mouse button, drag the field to the Slave key field column in the right pane and release the button. The same must be done for each slave. Note that you can also use the Auto mapping button or other buttons in each tab. Joining data in ExtMergeJoin works the following way. First of all, let us stress again that data on both the master and the slave have to be sorted. Some input data contain sequences of same values. Then they are treated as one unit on the slave (a slave record knows the value of the following record), This happens only if Allow slave duplicates has been set to true. Moreover, the same-values unit gets stored in the memory. On the master, merging goes all the same by comparing one master record after another to the slave. In case there is a large number of duplicate values on the slave, they are stored on your disk. A transformation in ExtMergeJoin is required. Use one of the Transform, Transform URL and Transform class attributes to specify the transformation. A transformation in ExtMergeJoin lets you define the transformation that sends records to the first output port. The unjoined master records sent to the second output cannot be modified within the ExtMergeJoin transformation. For detailed information about CloverDX Transformation Language see Part X, CTL2 - CloverDX Transformation Language. ExtMergeJoin now has a second output port. Metadata propagation has been affected as well.